New technologies are changing the market. All the more important it is for a company not to miss any relevant future technology. In the years 2009 and 2010, a global German high technology company used the support of the FutureManagementGroup AG to identify the ten most important emerging technologies in each of its four business units. The technologies should lie outside the current core technologies. The goal of the project was the early recognition of future markets in these technologies. For this purpose, we used a broad toolset in accordance with the Eltville Model of future management. The FutureManagementGroup AG (FMG), founded in 1991, is an international group of experts specialised in future management and the early recognition of opportunities in future markets. Using the “Eltville Model” and various future management methods and tools, we built a methodological bridge from management practice to futures research and back to daily business. Future management comprises the entirety of all systems, processes, methods and tools for early perception and analysis of future developments and their inclusion in strategy. Future management makes it easier, and in many cases possible at all, to use the results of futures research as a resource for orientation and inspiration in a business context. The blue futures glasses look at the probable future → assumption analysis. The guiding question is: How will our market(s), work and living environments change in the next five to ten years? The red futures glasses look at possible surprises in the future → surprise analysis. The guiding question is: How should we prepare for possible surprising events and developments in the future? The green futures glasses look at the creatable future → opportunity development. The guiding question is: Which opportunities for new markets, products, strategies, processes and structures will arise from these changes? The yellow futures glasses look at the desired future → vision development. The guiding question is: What does our company need to look like in five to ten years time in the sense of a strategic vision? The violet futures glasses look at the planned future → strategy development. The guiding question is: How do we need to design our strategy to realise the strategic vision? 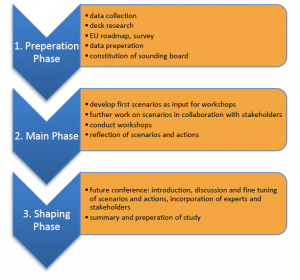 The five futures glasses form the process model of the Eltville Model. You cannot wear all five futures glasses at the same time or the future will remain unclear and confusing. You need to put your different futures glasses on one after the other to form a effective working process. The Eltville Model has been developed through research and in more than a thousand workshops and projects with leading corporations as well as with non-profit organisations around the world. It is a unique model that consistently resolves the confusion concerning the future, creates clarity and provides a productive way of working with sound insights and results. The most important goal of the project was to identify “amazing technologies” outside a client’s current capabilities but with a potentially high impact on the existing business of the client. We were asked to evaluate the exact relevance of these technologies for the client’s business to deduce new market opportunities of these technologies and evaluate their potential. Our solution to accommodate these needs was a “future business radar”. The focus was on the blue futures glasses (assessment of technologies) and the green futures glasses (development of opportunities). Less focus had been given to the yellow futures glasses (assessment of opportunities and decision, which opportunities should be pursued). Not included were the violet futures glasses: With the completion of the project, the business units have individually taken responsibility for developing the strategy to enter the future markets that were identified as relevant to their business. What is it that your customers actually pay for when they purchase your product? What is the actual use that your customers would like to obtain from your product? Primary functions: Core functions of a product or service for which it was invented. The main reason for its existence (e.g. sealing). 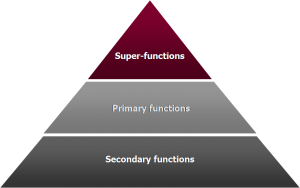 Secondary functions: Additional functions the product or service fulfils beyond its core use. They often are the decision criteria of customers if several products can fulfil the primary functions reasonably well (e.g. convenience, cost saving). The relevant functions were developed in a workshop with the project team consisting of representatives of all business units and enhanced through independent analysis by FMG. The functions were then transferred to visual maps, reviewed by the business units and jointly further developed by FMG and the project team. Which Ones Are Potentially Relevant? 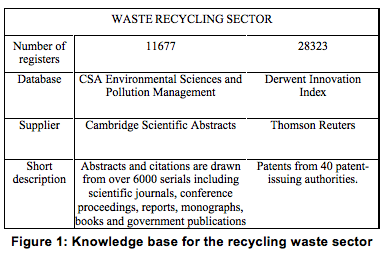 The long list of technologies was developed from extensive secondary research. All technologies that are described in current literature as emerging and/or as gaining importance in the future where considered for the long list. The single selection criterion for inclusion in the long list was the existence of a conceivable relation to a single function of one of the business units. The connection of a technology to a function is a valid indicator for its potential relevance. It shows that the technology can change the way in which the function is performed in the future. It can provide new solutions and products as well as change business models, thus changing value creation in the market. A total of 180 potentially relevant technologies have been identified. An important source in the desk research was the FMG-FutureNet, a semantic database of futures knowledge. It is a knowledge network, modelled on the human brain, in which items of future information are saved and linked. We structure the available future knowledge and evaluate, summarise, substantiate and meaningfully link the individual items of futures information. In addition, we add information gained in our projects. 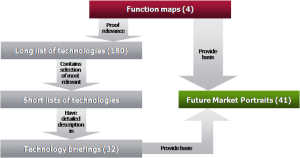 As a result, the FMG-FutureNet has become a unique database of future markets. For the technology radar project, we additionally evaluated websites, studies, books and magazines. The technologies from the long list were evaluated along two criteria: “impact on industry” and “reasonable time horizon”. The initial evaluation was done by representatives from the business units on a 9-point scale. A second evaluation was performed by FMG leading to some technologies with low rankings to be reconsidered. After a structured discussion process, each business unit selected ten technologies for deeper analysis. In total 32 different technologies were analysed and the results summarised in technology briefings. A future market is a solution for important future problems or desires of certain people that develops or will generate significantly more revenue in the future. Examples of future markets include augmented reality glasses for smartphone users, robots that carry luggage and equipment for the military, or affordable space tourism for adventure travellers. The difference between a future market and a future trend or future technology is that one can additionally imagine which concrete solution people would actually be prepared to pay for and how you can make a profit out of it. Future market opportunities were developed through analytical and creative thinking, including input like future factors and methods like meta-opportunities, which we would like to introduce here briefly. Future factors in technology and science that will change processes and methods as well as products, services and solutions. 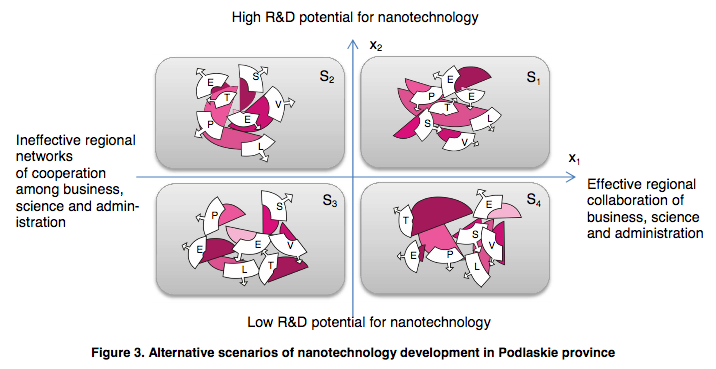 Examples are nanotechnologies, dematerialisation, informatisation, micro-system technology, robotics or neurotechnologies. Future factors primarily represent the view through the blue futures glasses but can also be used as a technique to support creative thinking. This is especially fruitful when future factors have no direct relation to the client’s industry. Meta-opportunities are repetitive patterns that are recognisable in many future opportunities. These patterns are recipes and shortcuts for opportunity recognition. They illustrate models of best-practice thinking and stimulate the search for opportunities. Through the use of meta-opportunities, productivity and the value of opportunity development can be increased considerably. Which problem is solved? Which desire is fulfilled? Whom is the solution delivered to? How is the solution special? Finally, the time horizon of the future markets was evaluated from a technical and a demand perspective; the markets were classified in terms of their distance from current capabilities. An important goal of the project was not to miss any relevant technology. This was ensured by an overview scan and the analysis of the results of futures research concerning the emergence and further development of new technologies. Simultaneously, the technology radar served as a future business radar, as it identified the most promising future markets that lie in the most important technologies. Out of 180 technology candidates that were included in the long list, we created 41 differentiated and in-depth future market portraits. The project has shown how function-based technology assessment can contribute to identify relevant technologies outside current competencies and businesses – an essential requirement to recognise potentially profitable future markets. markets research provides a solid analysis of market prospects, key challenges and possible business models. It thus allows sound investment decisions for the development of a future market. 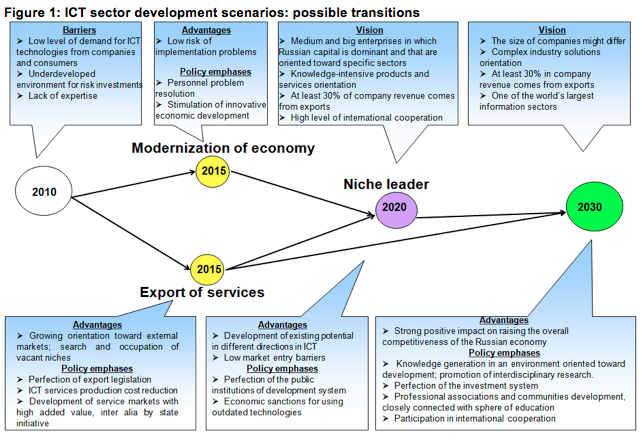 Mićić, Pero (2010): The Five Futures Glasses: How to See and Understand More of the Future with the Eltville Model. Houndsmill, Basingstoke, Hampshire: Palgrave McMillan. Mićić, Pero (2007): Phenomenology of Future Management in Top Management Teams. Leeds: Metropolitan University. Mićić, Pero (2006): Das ZukunftsRadar. Die wichtigsten Trends, Technologien und Themen für die Zukunft, Offenbach: GABAL-Verlag. The Polish technological foresight project entitled ‘Advanced Industrial and Ecological Technologies for the Sustainable Development of Poland’ was dedicated to support the development of technologies enhancing sustainable development and staff training for the generation and exploitation of advanced technologies. 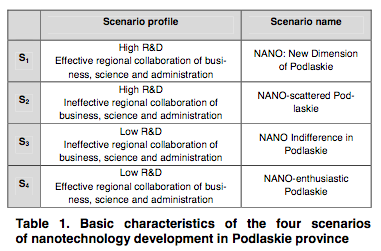 The main objectives were preparing proposals for a new strategic programme directed at advanced industrial and ecological technologies in Poland, identifying and promoting professional competences in the advanced industrial technologies domain, supporting investment decisions and the implementation of innovative process and product solutions, and elaborating scenarios of technological and social development geared toward sustainable development objectives with a time horizon of 2020. The project was coordinated by the Institute for Sustainable Technologies – National Research Institute in Radom, Poland (ITeE – PIB) within the European Innovative Economy Operational Programme. It is essential to introduce long-term research programmes based on innovative technologies to deliver a more sustainable economy. 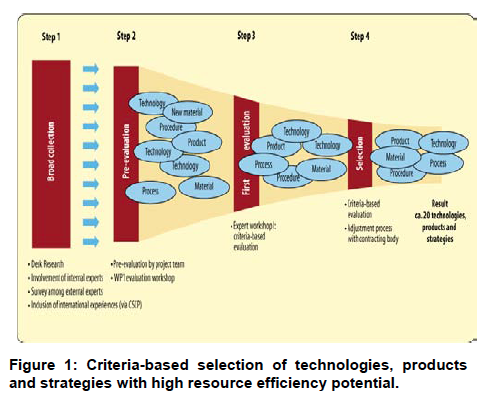 Efficient technology forecasting and focusing on specific basic and applied research areas that might lead to implementing results in the field of advanced technologies are crucial to a knowledge-based economy. For the unfolding acceleration of global innovation that is expected, it is necessary to develop only the most promising areas of scientific activity and business at different organisational levels: national, regional and corporate. The development and implementation of priority technologies enhancing sustainable development will contribute to a future increase in the technological level and competitiveness of enterprises that exploit innovative solutions. Therefore, technology foresight projects have important issues to address. The principle of sustainable development was of key importance to the National Foresight Programme ‘Poland 2020’ realised between 2007 and 2009. 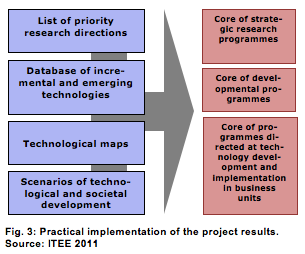 The outcomes of the programme included R&D priorities in the following research areas: ‘Information and Telecommunication Technologies,’ ‘Safety’ and ‘Sustainable Development of Poland.’ However, the determined R&D priorities were too general to enable scientific-research institutions, such as the Institute for Sustainable Technologies – National Research Institute, to effectively identify, sort and prioritise detailed research projects or to allow companies to make investment decisions concerning particular innovative technological solutions. 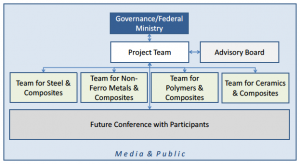 The main aim of the research within the aforesaid project was to generate promising research and development directions in the fields of manufacturing technologies, application and operation of machinery as well as environmental protection, to indicate priority technologies within the framework of selected research areas, and prepare descriptions of their characteristics and development scenarios, which was the main aim of the sectoral foresight project presented here. Advanced material technologies, nanotechnologies and technological systems supporting their design and applications. A special research and testing apparatus. Mechatronic technologies and control systems for supporting processes of manufacturing, operation and maintenance. Pro-ecological technologies, rationalization of the exploitation of materials and resources, and renewable sources of energy. Technologies of technical and environmental safety. Moreover, the project made it possible to identify the needs concerning the knowledge and competence necessary to develop and apply new technologies as well as to develop descriptions of future jobs and the relevant qualifications. This will facilitate the preparation of recommendations with respect to new standards of professional qualifications and supplementing existing standards and provide a foundation for the development of modular programmes of education and professional training. The implementation of these programmes will contribute to the efficient organisation and carrying out of education, training, professional skills improvement and retraining designed to educate personnel for advanced industrial technologies. Elaborating a strategic research programme concerning sustainable development. determination of probability of future scenarios. In this brief, we concentrate on how and with what results the first main issue, identification of key variables, was tackled. The subsequent issues concerning technology prioritisation and the probability of scenarios will be discussed in subsequent articles. 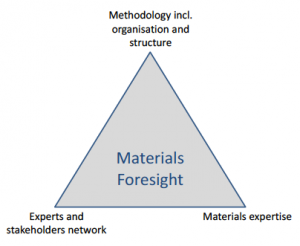 The classical methodology generally used in foresight exercises enables the creation of scenarios considering only two key variables. Utilizing the experience acquired in a number of foresight projects, we have developed a methodology allowing to create much more complex future visions based on tendencies of an unlimited number of key variables. The main goal of this effort was to identify all crucial factors that might influence technology development, thus identifying options to actively shape the future. Furthermore, this knowledge about the drivers of technological change provide criteria for assessing the usefulness of new strategic programmes in the future. The methodology for generating multidimensional scenarios used in the project was based on Boolean logic, structural analyses, and expert knowledge, which is fundamental to foresight projects. We investigated relations between important system factors and determined the ones most crucial in shaping the future system. Social, technological, economic, ecological and political factors all have an impact on technological development and were all considered accordingly in the structural analyses. We applied a cross impact analyses for the selection of key variables. For this purpose, we used the computer-aided program MIC-MAC. The classical method of performing structural analyses was modified and adjusted to the project requirements. 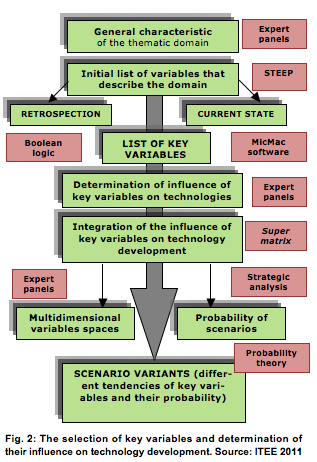 The auxiliary techniques used in identifying the key variables were STEEP, probability theory and strategic analysis. 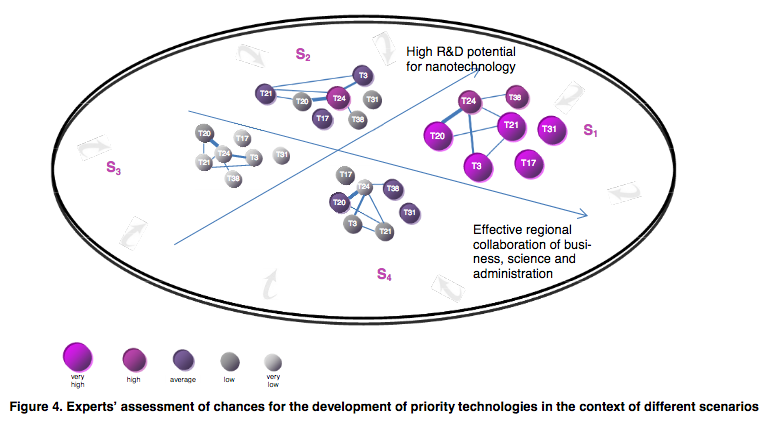 The algorithm illustrated in Figure 2 enables selecting key variables that significantly influence the internal and external environment of technology development. 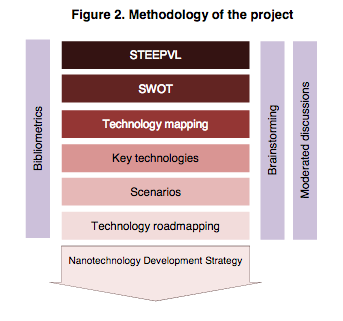 Since the core area of the project concerns advanced technologies, scenarios and strategic plans must also include the development paths of technologies and research priorities. 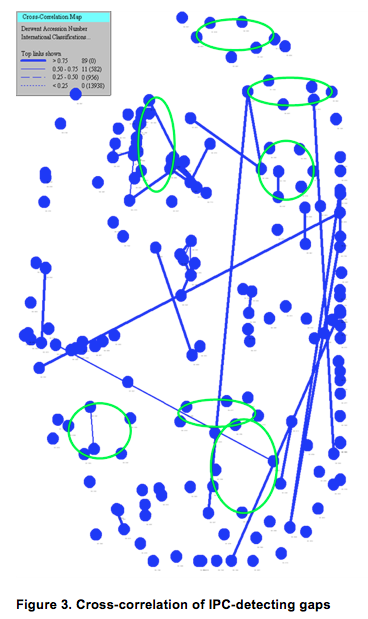 Therefore, the algorithm considers procedures for determining mutual influences between system drivers. 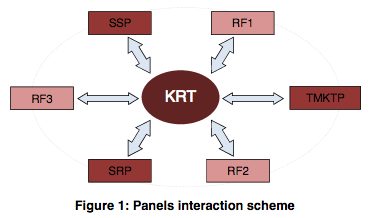 Moreover, the influence of key variables on technology development is also pointed out in the Super matrix. To go beyond traditional techniques, we adapted methods of strategic analyses to forecast technological change. We furthermore integrated into the presented algorithm the methodology of technology prioritisation and scenario building based on the probability and direction of impact that a key variable has on a certain technology. This allows determining key variables that can be deliberately influenced to achieve assumed future scenarios and realise strategic plans. 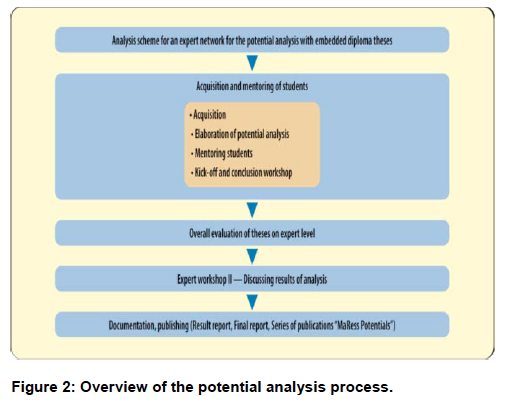 The results of these analyses, together with the results of technology prioritisation and probability assignment, were used to formulate recommendations for determining future priority research areas. This methodology of generating multidimensional scenarios has a modular structure and can be modified in accordance with user requirements. 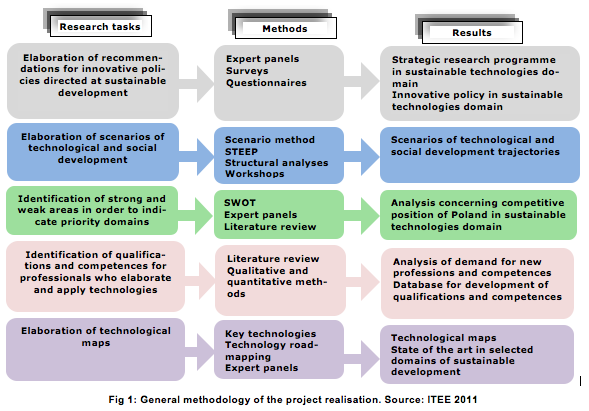 The results of the project ‘Advanced Industrial and Ecological Technologies for the Sustainable Development of Poland’ were taken into account in preparing proposals for strategic research programmes in the area of technical support of sustainable development (Fig. 3). One of those programmes, ‘Innovative Systems of Technical Support for Sustainable Development of Economy’, has been selected in a competitive process from among a number of proposals by significant national research organisations and has been granted funding through the European Union structural funds. 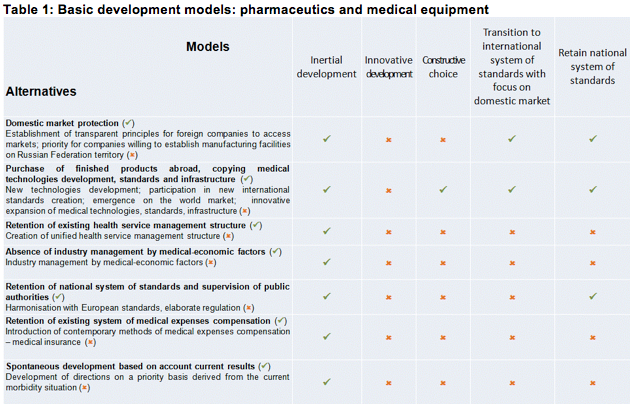 Moreover, the project results are not only planned to be used in preparing other future research and development programmes but also in realising cooperative endeavours with the business sector in order to implement technologies recognised as priority ones. Arcade, J., Godet, M., Meunier, F., Roubelat, F. (1994): Structural analysis with the MICMAC method & actors’ strategy with MACTOR method, AC/UNU Millennium Project Futures Research Methodology. Gierszewska, G., Romanowska, M. (2009): Analiza strategiczna przedsiębiorstwa, PWE Warszawa, pp. 188-190. Loveridge, D. (1995): What are scenarios for? In: Profutures Workshop, Scenario building, Convergences and differences. Workshop proceedings, Seville, European Commission, pp. 13-16. Mazurkiewicz, A., Poteralska, B., Karsznia, W., Łabędzka, J., Sacio-Szymańska, A., Wachowicz, K. (2008): Raport z realizacji prac w ramach Panelu Pola Badawczego ”Zrównoważony rozwój Polski”, II etap realizacji prac – opracowanie scenariuszy rozwoju, ITeE-PIB, Radom, listopad. Mazurkiewicz, A., Poteralska, B.: Zrównoważony rozwój Polski. W: Kleer, J., Wierzbicki, A. (eds.) (2009): Narodowy Program Foresight Polska 2020: Dyskusja założeń scenariuszy. Komitet Prognoz “Polska 2000 Plus” Polska Akademia Nauk, pp. 105-152. Oniszk-Popławska, A., Monica, B., Joergensen, Birte H., Velte, D., Wehnert, T. (2003): ENER Forum 5. Technological change, market reform and climate policy, Bucharest, Romania, 16-17 October 2003 – EurEnDel. Popper, R.: Foresight Methodology. In: Georghiou, L., Cassingena, J., Keenan, M., Miles, I. and Popper, R. (eds.) (2008): The Handbook of Technology Foresight, Concept and practice, Edward Elgar, pp. 44-88. Mazurkiewicz, A. (ed.) (2010): Report “Scenariusze trajektorii rozwoju technologicznego i społecznego w obszarze zrównoważonego rozwoju” opracowany w ramach projektu “Zaawansowane technologie przemysłowe i ekologiczne dla zrównoważonego rozwoju kraju”, maszynopis, Instytut Technologii Eksploatacji – Państwowy Instytut Badawczy, Radom.